Ask Anything Through Facebook Messenger - No Humans Needed! You can now ask anything through Facebook Messenger with no human help needed – AI does the work! The Portuguese startup HiJiffy increases Hotel’s revenues with direct bookings, whilst offering guests a top service, with a 24/7 communication channel. HiJiffy service answer Frequently Asked Questions in an automatized way, empower guests to book directly in Messenger and handoff to a human agent if necessary. Nowadays people associate efficiency with a real-time response and the hospitality industry is no different. A recent survey and data research suggests hotels ought to be paying more attention, than they are now, to mobile messaging and requests from guests. People are actually more connected to their smartphones when they are away from home – the smartphone becomes their travel companion. Therefore, hotels must recognise that mobile channels are extremely important. It is in this scenario that Portuguese startup appears – a virtual assistant that replies to guest queries and incentivise them to book through the Hotel’s Facebook page. 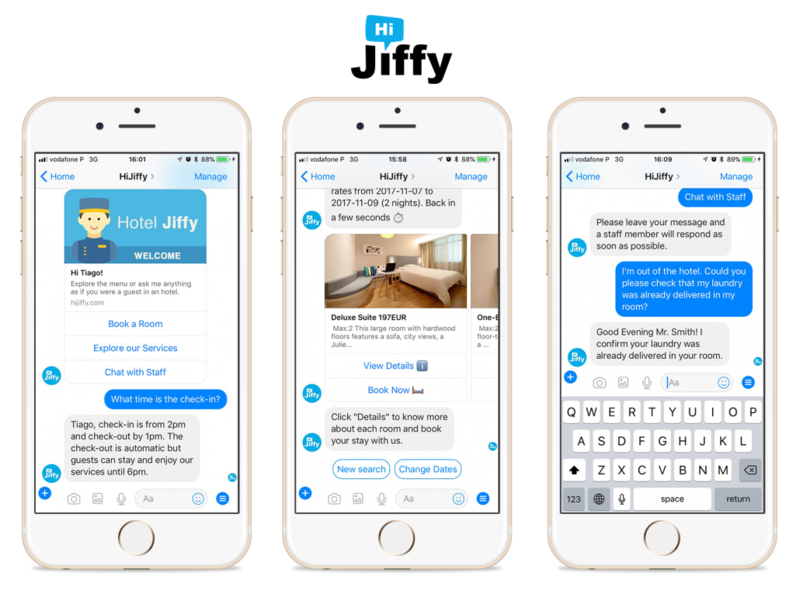 “The big difference is that all this happens in the Hotel’s Facebook Messenger, where it will be possible to book a room or access services offered within the hotel,” mentions Tiago Araújo, one of the founders of HiJiffy. Bearing this in mind, if a guest chooses a hotel that offers their service, he can use Facebook Messenger to check availability, book a room and find the answer to his queries. Whenever the chatbot does not understand the response, it automatically transfers the guest to a staff member of the Hotel, so he can reply manually. HiJiffy’s technology will learn from this response and next time it will be able to reply without needing any human intervention. This service is proven to increase Hotel’s revenue with direct bookings, whilst offering guests a top service, with a 24/7 communication channel with the hotel. The startup is currently focused on the Portuguese, Spanish and UK markets. The team has a global ambition: in 2018 is planning to expand all over Europe and aims to tackle the United States market during 2019. HiJiffy service answer Frequently Asked Questions, handoff to a human agent if necessary, enable the booking directly in Messenger and re-engage with guests to make sure they book with the hotel. In only three months, they were able to build a minimum viable product which was test-piloted in two hotel chains in Portugal. The preliminary metrics were so promising that they joined NUMA Barcelona acceleration program (a joint venture between NUMA Paris and mVentures who organizes Mobile World Congress). Throughout 4 months, the team worked with extraordinary mentors, such as Sébastien Lefebvre and with more than 100 hotels with the aim of improving and expanding their innovative product. In February 2017, they joined FB Start Program where they have to date a direct relationship with Facebook Messenger Product Team with the purpose of together improve the chat solutions within the hospitality industry. In June of the same year, they were selected and funded by the Horizon 2020. This fund is known for selecting the best tech-disruptive companies in Europe. In September 2017, they were chosen by Marriott to test-pilot in one of their London hotels and successfully implemented the first chatbot in a Marriott property. According to Tiago Araújo, “the experience has been game-changing”. The team has access to all the operations of the hotel and has the opportunity to optimize their product taking into consideration the feedback from the hotel staff and guest needs. The journey is only in the beginning but the results talk for themselves. One of their clients had more than 5000 guests chatting and from all the queries they did, 75% were automated. Furthermore, the startup managed to do more than 20.000 euros only for 1 hotel through direct bookings on Facebook Messenger. Over 2.5 billion people have at least one messaging app installed and it is projected that, by the end of 2018, a total of 3.6 billion people will be using messaging apps to connect with their family, friends and businesses – messaging apps are the new social media. As a result of that, an increasing number of Hotels is already offering messaging solutions to their guests. “Artificial intelligence is no longer a technology related with the future, it’s now the present and the hospitality industry can majorly benefit from it,“ assures Tiago Araújo. Therefore, the process of using artificial intelligence is fully automatized and developed by his team at the Hotel’s Facebook Messenger, with a minimal commitment from the hotel’s staff. With HiJiffy, the guest only needs to find the hotel’s Facebook Page, click the message button and start the conversation with the chatbot. Competition currently offers standardized mobile applications where guests have to download a new app, even though 77% of users never use an app again 72 hours after installing, resulting in a lack of guest engagement. With this solution, guests don’t need to install a new app and get to, instead use one they are already familiar with. Pedro Gonçalves is Co-founder of HiJiffy, a service that enables guests to access hotel services through Facebook Messenger. The automatisation is built with artificial intelligence by their team within the hotel's Facebook Page.